A blown glass chandelier called Bubbles in Space, 2009. Designed by Jitka Kamencovà-Skuhravà and currently on display in All the Best! Czech Art Glass at the Museum of Decorative Arts in Prague. This playful chandelier communicates well with the delicate floral patterns on the ceiling and enlivens the atmosphere. The juxtaposition of old and new creates a spark of excitement. There is a dialogue created between different mediums, times and techniques. Something new is said! 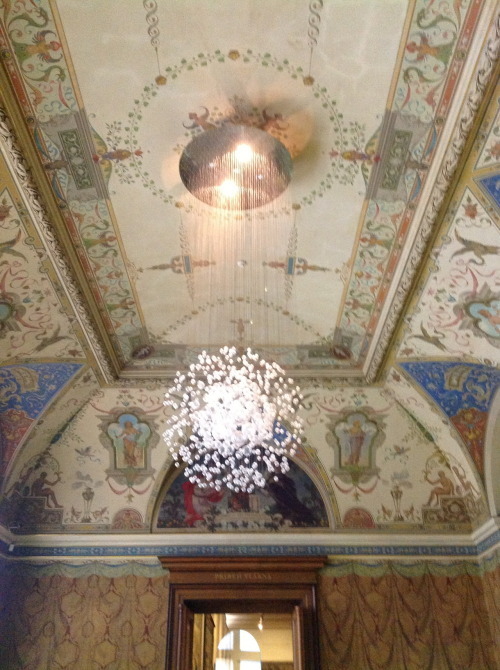 Seeing the chandelier in situ is what makes us dream of owning it for ourselves. To our minds and senses this light is the most successful part of the exhibition.